Last year when Zuffa, LLC sold the UFC to Hollywood mega-talent agency WME|IMG for $4 billion—$3,998,000,000 more than Zuffa had paid for it just 15 years earlier—it was a ground-shaking event, the most money anyone had ever paid for any sports franchise and confirmation, as if any were needed, that MMA had at long last, and after many, many years of doldrums, shame, controversy, and insolvency, become legitimate. Suddenly the UFC was owned by a company run by a true Hollywood giant, Ari Emanuel—a man honored (and lightly mocked) on HBO comedies, a brother to the sitting governor of Chicago and a kingpin in the Democratic Party, a man who had represented Donald J. Trump. Suddenly Emanuel’s clients, Hollywood royalty every last one of them, were lining up to invest: Ben Affleck, the Williams sisters, Mark Wahlberg, LL Cool J, and on and on and on. But all that star power paled in comparison to that number: $4 billion! A number to light up the sky! And for a cage-fighting league! No one, not even UFC President Dana White—then, now, and forever the promotion’s biggest booster—would have believed back in 2001 that such a thing was possible. $4 billion was inconceivable, unimaginable, impossible, surreal. Well, yesterday White revealed during an interview on UFC Fight Pass that WME|IMG’s number wasn’t even the biggest one offered. No, apparently, two other offers came in last year that were bigger than WME’s. The biggest, White said, topped out at $5 billion. Which means the UFC left $1 billion—a sum greater than the Gross Domestic Product of more than a dozen countries—on the table. What a strange move for a roomful of businessmen to make. But according to White, he and Lorenzo and Frank Fertitta, the brothers who own Zuffa, never saw money as their primary motivator when it came to decision-making. For them the concern was always about making moves that would take the organization, and MMA in general, to what he calls the “next level.” Thus the decision to agree to the lower offer that came in from WME|IMG, a company White and the Fertittas believed had a plan for expanding the empire that the three of them had built from virtually nothing. And apparently that somebody was Emanuel, a longtime talent agent who shook up Hollywood in 2009 when he merged his Endeavor agency with the legendary William Morris, “rewriting the Hollywood script,” as the Financial Times said, in the process, and earning himself a spot as one of the “biggest guns in the consolidating entertainment business,” according to Forbes. Since the merger WME|IMG has branched out into advertising, music publishing, e-commerce, branding, beauty pageants, eSports, and actual sports. In addition to owning the UFC, WME represents the NFL and the NHL. The Emanuel model is to create new worlds by bringing every world together: to blur all the lines. 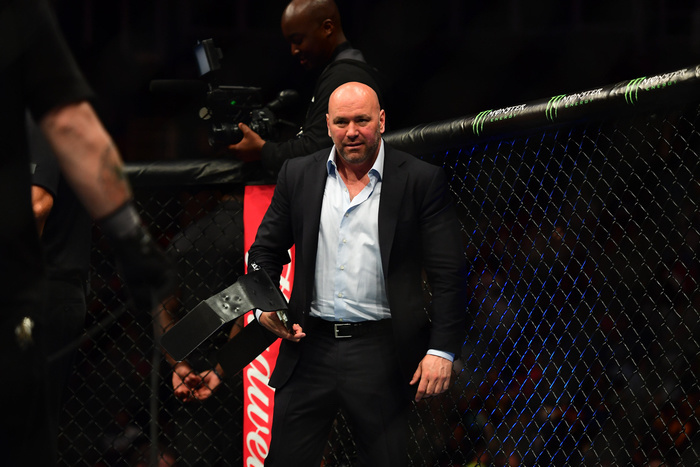 Considering Emanuel’s success in expanding the concept of consolidated entertainment and creating and merging new markets, White said it was a no-brainer for Zuffa to take accept the smaller offer. “It’s just going to be so much bigger for the sport, obviously for the brand, and for the fighters,” White said. And what’s a billion dollars when you have a chance to roll with a king? Does the UFC's Sale Have a Sports Business Parallel?